Your Wii is hard modded and you want to retain playing retail and backup Gamecube games from the disc channel. Your Wii is not capable of playing backup games from disc. Easy test: In the latest NeoGamma, remove disc from the drive and select launch game from disc. You will get a read error. If it doesn't say anything about your drive, then it should capable of playing backups. I have compiled a package of Game Cube apps that you will need for this process. log in to download from Hacksden. I recommend using a 2GB Sandisc SD card. for best compatibility. Wii system menu 4.0 and above have SDHC card compatibility, but the higher the capacity of the card the less compatible it might be. I always use a Sandisk card for best results. Neogamma IOS Switcher - change the IOS that neogamma boots games with. Ctr-Gcs : DacoTaco Edition is a tool built to create or restore full, raw memory card backups and GCI save files just like the GC application Ctr-gcs did. These dumps can be saved to restore later or be used in emulators like Dolphin-emu. Unlike ctr-gcs however, this utility can read or write to unofficial memory cards; no matter what its size is. Also please note that if you restore a corrupt dump to a memory card, or if the program shows an error while creating or restoring a dump, you may end up with a corrupted memory card. If you know you already have the correct cMIOS installed, or used ModMii to do a full Wii softmod then you may skip this part to install the cMIOS, no need to reinstall it. If you don't know if the cMIOS is installed then it wont hurt to reinstall it. Installing this cMIOS will overwrite any MIOS/cMIOS you have already installed. Neogamma Internal mode currently does not support Waninkoko's cMIOS, install this cMIOS. Unzip the cMIOSWiiGator archive, copy the cMIOSWiiGator folder to the apps folder of your SD card. Run this in the homebrew channel, don't for get to use IOS249 to do the installing. Select YES for both of the settings before installing. I can confirm the SD card and Download from NUSD methods of installing. USB install is possible but I did not test that, so I cannot confirm if it works, so don't ask about it. If you get usb install working then good, if you can't then use the SD card to do it. It seems that WiiPower has changed his mind on which cMIOS to ues. 'MIOS' is the old behavior, it just starts the MIOS if a GC disc is inserted. 'internal' starts the included GC Backup Launcher from WiiGator(requires compatible cMIOS). Unzip the NeoGamma archive to the root of your SD card. You may discard the "source" folder, unless that kind of stuff interests you. You now have Neogamma installed to the SD card. Do not change the names of any of the folders. Unzip the NeoGamma forwarder - DFNG archive and copy the NeoGamma Loader - DFNG.wad to the wad folder of your SD card. Use WadManager to install this wad. You will now have a NeoGamma forwarder that boots Neogamma from the SD card. IOS35 is needed to run the forwarder, if it don't work then install IOS35. Select options, then select General Options. Set the Force Video to Disc. Unless it's an out of region disc, the select your preference. If you are using component cables then Force Video to disc may not work, use what ever seting works. Return to the Main Menu of NeoGamma and Launch Game. If your games fails to launch, you may have to play around with the GC settings, also check the compatibility list, link posted below. leave the GC mode set to internal, try adjusting the rebooter first, then try the High plugin or debug. If you have color issues then change the Patch Video. The 26 Nintendo GameCube games that have sold or shipped at least one million copies. CleanRip will rip Wii/GC games to a FAT/NTFS storage device (SD or USB). I recommend a FAT32 USB memory stick larger in size than the ISO you are ripping. The author of CleanRip says there may be a chance to corrupt existing data on the storage device. Just install CleanRip on your SD card and run from HBC, follow the on screen prompts, simple and easy. When the process is complete you should have a 1.35 GB gamecube ISO on your storage device, ready to burn to disc. Neogamma, use the version from the download list above. select the region of the ISO to be created (USA, PAL, JAP), I am not sure if this will patch an out of region ISO, always use an ISO of the region of your Wii. you will now notice that a folder named "Compressed Images" and the multigame ISO have been created. delete the multigame ISO that was created, you need to run FSTFIX on the compressed images. 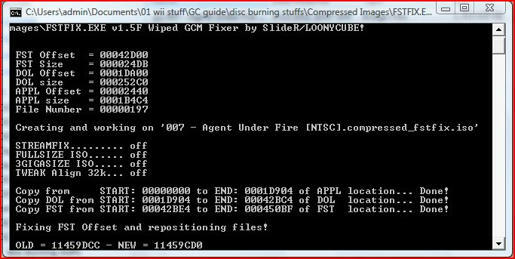 drag and drop a compressed GC ISO on the FSTFIX application and wait for it to complete the process, the FSTFIX dialog box will disappear when completed, and your ISO will be fixed for a multigame ISO. repeat step 12 for each compressed ISO to be added to the multigame ISO. now lauch the multigame ISO creator again and load the compresses ISO images from the Compressed Images folder. once the images are loaded, select the region of the ISO you are creating, no need to compress the images (ther're already compressed), now click the "Create MultiGame ISO" button. Right click the image that was created and select "burn using IMGburn", you need IMGburn installed for this. then stick with DVD -R. When burning DVD +R then set book type to DVD ROM. Do not use Verbatim Lifeseries line of media, it is junk. - right click on the image (ISO/gcm) file to be burned. - select "burn using IMGburn"
- make sure your screen saver or virus scanner don't start running. - go get a sandwhich or something while burning, just leave your mouse alone. If your backups are not working and you failed to use the recommended blank DVD media then do not ask why your backups are not working. Warning: It is illegal to download/distribute copyrighted video games. This guide, myself, and this site does not support or promote software piracy. Play fair. THIS APPLICATION COMES WITH NO WARRANTY AT ALL, NEITHER EXPRESSED NOR IMPLIED. NO ONE BUT YOURSELF IS RESPONSIBLE FOR ANY DAMAGE TO YOUR WII CONSOLE BECAUSE OF A IMPROPER USAGE OF THIS SOFTWARE. Thanks for posting this guide, stomp!! I have used this a few times (on older wii's I've modded) and had 100% success. Awesome guide. Again, thanks!!! 1. 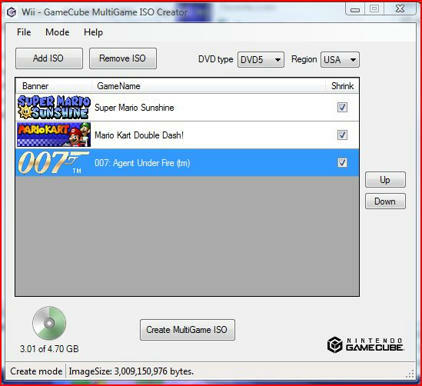 Create a Multi-Game ISO that has both Disc 1 and Disc 2 of the game using the provided tool. Don't shrink the game (not sure, I just haven't tested this so don't bother shrink it). 2. Burn the image onto a DVD. 3. Launch your game using Neogamma R9 Beta 49 or later. 4. Play your game and enjoy, eventually you may get prompted to switch to disc 2. 5. Simply, eject the disc in the dvd drive and re-insert the same one. It'll begin checking the disc then continue. I've just set this up and it appears to have worked but Do you require a gamecube controller to play them or will a classic wii controller work? as the wii remote has lost sync and i cannot do anything apart from hard reset the wii. Yup. Definitely need a gamecube controller. When mIOS is loaded, Wii Mote's no longer work. Cheers, thought that was the issue just wanted to make sure. cMIOSWiiGator won't let you install from USBdrive but with the one i linked you can download the cMIOS v10 from internet right on your wii. It works great! Sorry, but that installs the Waninkoko cMIOS, if you read my first post, WiiPower claims the Waninkoko cMIOS rev5 will not be fully compatible with NeoGamma. The cMIOS installer that is provided was altered by WiiPower, so it will work best with NeoGamma. soo..If I have a WODE installed, and I follow this guide..will I no longer be able to use my disc drive? I don't know much about a WODE. I do know that a WODE will play Gamecube backups without softmodding your Wii, just put the games on your hdd with your Wii games and see what happens. I also know that some hardmods do not play well with softmods, as for a WODE, I do not know. If you follow Mauifrogs guide to softmod any Wii, then you will have the proper cMIOS installed. That guide installs the same cMIOS that this guide has you install. The cMIOS will allow you to play GC games via softmods. If your WODE gives you an error when trying to boot GC backups with the cMIOS, then you must decide, play GC backups from WODE or from softmods, the choice is yours. If you do not like the cMIOS and it has a adverse effect on your WODE, then you can reinstall the original MIOS, back to the way it was before the softmod. The cMIOS should not affect your WODE's ability to load Wii backup games. Last edited by stomp_442; 11-13-2011 at 01:32 AM.